After the success of my first Colette Ginger skirt, I decided to make another one. 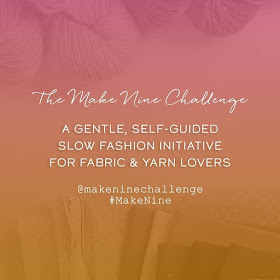 I read on a few blogs about some lovely new fabrics at Fancy Moon, so I had to have a look. I was not disappointed! The fabrics in the Printed Cotton Fabric section were right up my street. but turquoise doesn't suit me, and I don't like pink. I had red in mind, so I chose Imperial Kiku Red, Indochine by Alexander Henry. I layed out the fabric, and pinned on my pattern pieces, but realised I would end up with the big chrysanthemums right in the middle of each pattern piece. And, as much as I like the big chrysanthemums, it would have looked a bit mad. So I ended up cutting each piece separately, as I liked the black-edged flowers, and wanted to off-set them a bit (but I forgot to take a photo of that step). I think it turned out ok. I also made the waistband half the height as on the pattern. I'm small and found the waistband on my first skirt is a bit deep for my short middle. I finished hemming it this morning, but I haven't top-stitched around the bottom of the waistband yet. I want to wear it a few times first and see if I need to make any adjustments. I LOVE it!! It was much quicker to do than the first one, and I actually knew what I was doing. I haven't forgotten about my knitting though, but more of that another time. Oh yes - that's lovely! 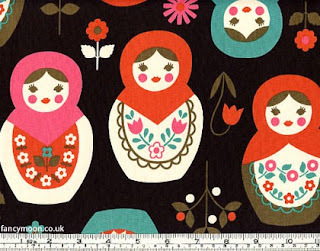 I love that Russian doll fabric - it would make a fabulous knitting bag! 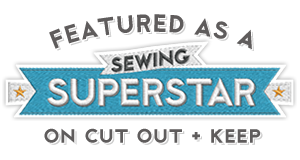 Your sewing is just great! I love that skirt - what are you planning to wear it with? I'm a bit sad that I've had to retire my quilting cotton skirts for the winter so I'm intrigued by any suggestions for how to wear them with winter garb.